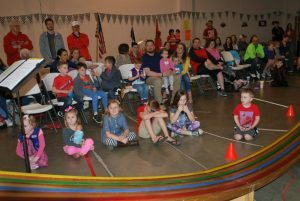 Saturday, March 25th, we enjoyed hosting the AWANA Grand Prix and were joined by our friends from Crossroads Bible Church of Chili, and Calvary Baptist of Coshocton. We had 70 cars in the race and four categories. A number of our own received trophies for first, second and third place and ribbons were received by all entrants. It was a great day and sweet to see our gymnasium full of kids and adults. Pastor Evans shared a devotion and we all enjoyed some great fellowship – not to mention lots of hot dogs and chips being consumed. Thanks to all who made the day such a special one and we give glory to God for His hand at work in our lives and the lives of boys and girls in our community.